suitable for flowers like dendrobium, candidum, orchids etc. and fruits and vegetables like bananas, tobacco, seaweed, green peppers, eggplants, bitter gourds, tomatoes, grapes, lettuce etc. Widely apply to gardening and hydroponics,especially when the plant needs extra light such as raining, snowing, dark indoor, etc. The plant light maybe can't stand up alone when you adjust the neck, if you want to put it on desk, you can clip one thick book or the desk surface. 1.The grow light is non-waterproof, don't touch water, keep it dry to avoid danger. 2.Please cut off the power when you don't use it. 3.The normal work environment is 20-40℃, 45%-95%RH, kept from heat sorce and wet environment in order to protect the service life. 4.Do not leave on 24 hours+, turn it on for 8-16 hours will be more suitable for you plants. ❶STRONG SUPPLEMENT TO SUNLIGHT FOR YOUR PLANT--- This LED plant grow light imitates sunlight to accelerate growth and boost photosynthesis process of your plants. Treat your plants to the benefits of 6 red(620-630nm wavelength) and 4 blue (450-460nm wavelength) and speed up their development to help them bloom and grow leaves and seeds in perfect health! 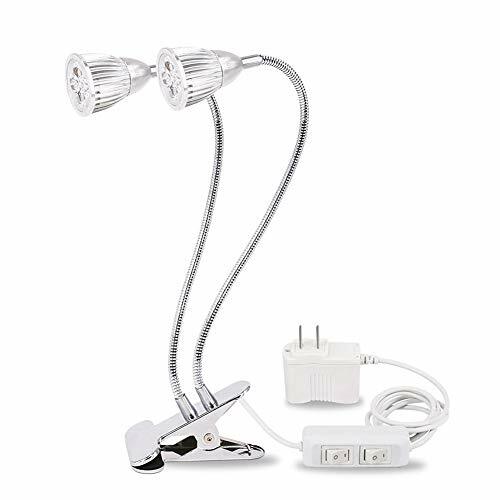 ❷UPGRADED DUAL HEAD AND SWITCH PLANT LAMP---You can adjust your LED grow light to your plants' individual needs and boost their growth with maximum efficiency! Each LED has it's own switch independently without needing to plug/unplug the lamp! ❸360 DEGREE FLEXIBLE GOOSENECK AND STURDY METAL CLAMP DESIGN --- Zsunda grow lights can be adjusted to any angle and placed nearly anywhere you can clamp it. With a strong metal clip (not plastic like others), it can be firmly attached to nearly any surface you can imagine. The adjustable, 360 degree swiveling gooseneck arm allows for targeting specific plant areas. ❹TOP ENERGY SAVINGS --- With Very Low power consumption, save money on electricity bills and reduce your energy consumption, boosting your plants' growth with an extra long service life and high luminous efficiency, this premium grow lamp has a lifespan of over 40,000 hours, needn't to change the bulbs any more. ❺WIDE APPLICATION AND ZSUNDA WARRANTY---This LED grow lamp is suitable for balconies, greenhouses, darkroom, office and so on. Also, customer satisfaction is our first goal. If there any questions, you can contact us and we will solve the problem for you as soon as possible! If you have any questions about this product by Zsunda, contact us by completing and submitting the form below. If you are looking for a specif part number, please include it with your message.